It’s a sunny November afternoon, and I am meeting Gabrielle Hill in a bunker. Well, in a way—walking through California College of the Arts’ MFA studios in San Francisco can feel that way with its windy, concrete courtyards and industrial aesthetic. There is even a perpetual grey that seems to hover over the studios. After making my way through the fog, I am delighted to see Gabe’s studio, number 32, tucked into the corner of Hoopertown. The work in her studio is the beginnings of her own imagined bunker: one where her protagonist is holed away from the end of the world. Gabe came to the Bay Area from Vancouver and is Metis and Cree. I met Gabe when we were both in Banff for In Kind: Negotiations exactly a year ago. I had just finished my own MFA at CCA the spring before, and she was in the process of applying to CCA herself. Seeing her studio made me thankful for a friend and fellow artist (the best sort of combination) who has experienced the same landscapes (or industrial MFA bunkers) as I have. My own studio has always been a sort of bunker: a place to hide away and get lost in my mind. 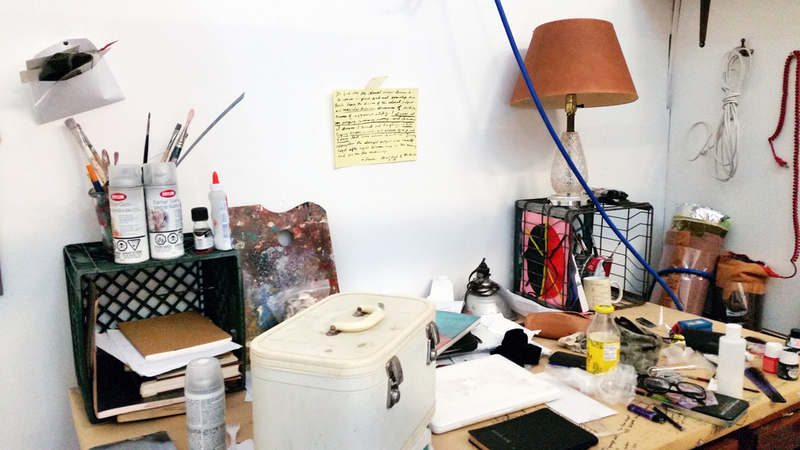 Gabe’s studio likewise was filled with piles and experiments and ideas. Nearing the end of her first semester, her work is beginning to coalesce after months of questions. 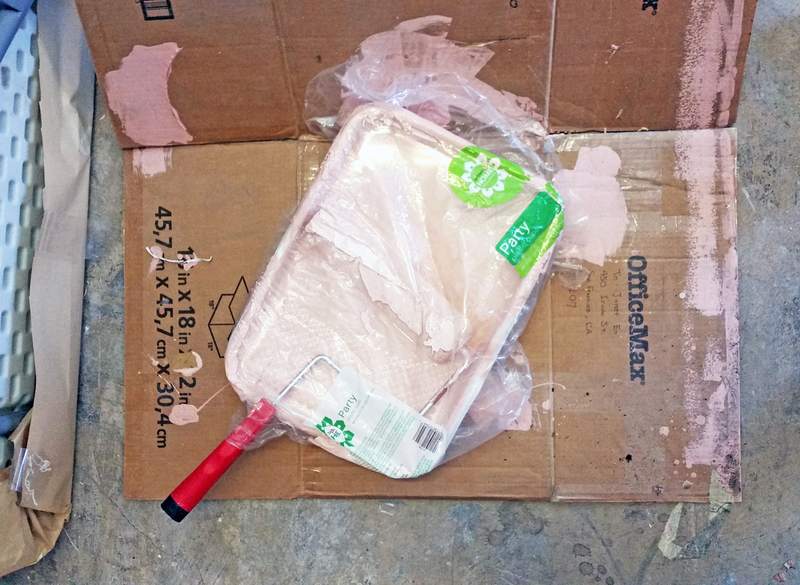 Car tires, a quilt, papers with notes, and house paint surround pieces in their infancy. She works in a variety of media, but today it seems her work leans toward sculpture. LTB: What's the project you're working on here? The first thing the colonial subject learns is to remain in place and not overstep [her] limits. Hence the dreams of the colonial subject are muscular dreams, dreams of action, dreams of aggressive vitality. I dream I am jumping, swimming, running, and climbing. I dream I burst out laughing, I am leaping across a river and chased by a pack of cars that never catches up with me. During colonization the aboriginal subject frees [herself] night after night between nine in the evening and six in the morning. Gabe is in the midst of a larger installation piece titled Muscular Dreams from this excerpt. There are obviously still the questions of how the piece will turn out, but she is literally scraping away bit by bit at its creation as she carves, paints, and wires each component. Gabe shares that she’s been thinking a lot about Jimmie Durham when he talks about “unknowable futures.” As an indigenous individual, he’s found that so much of his tradition has been lost, and is in many ways inaccessible. Without knowing the past, its projection into the future is equally unknowable, leaving a zone for questions and imagination. What could be more unknowable and questionable than this bunker amidst a sort of apocalypse? In her dreams, Gabe is often saving the world, waking to find herself feeling accomplished and victorious. Here I wholeheartedly relate: in my dreams I fight for my voice declaring danger to be heard and then physically rescue my loved ones (to then wake, feeling exhausted and anxious). I love the agency that I access in these dreams—not only over myself but over the entire landscape. It seems to me that Gabe is creating that landscape with her installation. I found myself getting lost in the space and in the imagined world she described. LTB: Could someone who is not indigenous make this work? GH: I think so! I think lots of people probably have these muscular dreams: colonized people and people just living under a system that feels immobilizing. This is just my own expression of this. She really hopes to create a fantastical and immersive space. Books by Ursula Le Guin and Octavia Butler sit around in her studio. Science fiction has long been a space where the politics of their authors get worked out, yet another space for agency and experimentation. LTB: How am I supposed to orient myself toward this work, or find my way into it? As a painter, sculpture has always been sort of mystical, and with three-dimensions I often get overwhelmed; but then Gabe pulled out a Jessica Stockholder book. I literally gasped because it gave me a foothold into sculpture. Jessica Stockholder’s work is like a painting you can physically enter. Wires and tubes are like paint strokes against a background—and Gabe also sees them as bunkers. Over the semester, Gabe has planned this extensive project. She has small goals for herself everyday. She's even decided on a palette. “My colors are usually all over the place,” she shares, and with this piece she is keeping to a palette of pink, blue, black, and white. LTB: What is a non-negotiable for you in making work? GH: Working with my hands. In a time of digital everything, Gabe wants to keep that physical connection to her work. In one intervention, she braided the grass of an entire hillside, working slowly and methodically, chatting with the camera person who filmed part of her project. That sort of down-to-earth tone in her voice and in her work is apparent throughout her studio and in this new project. 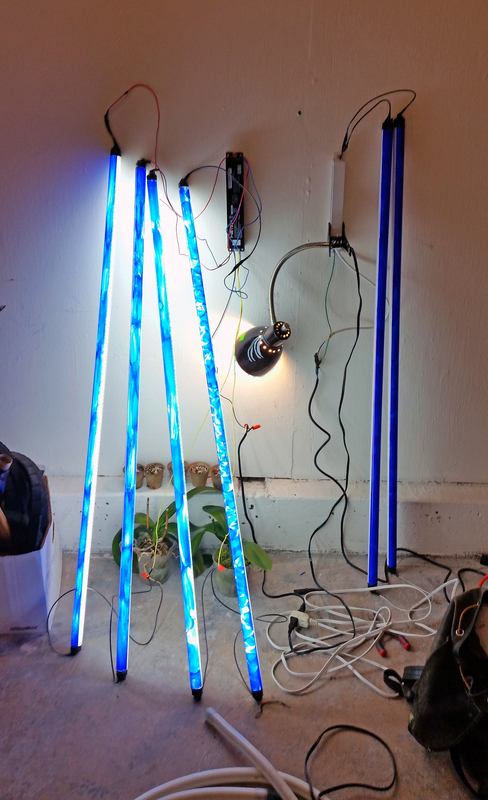 One area has tube lights painted an ultramarine on one side, while the other shines down on the tiny tobacco plants she is trying to grow in her studio. She started them in her apartment in sunnier Oakland, but they seem to be struggling in the studio despite her best efforts to research what they need. The pure light is strong, and I easily lose myself in it; and for once those orange electrical cords are beautifully accenting the lights they power. After learning to wire the lights herself, Gabe is building a light box for the tobacco, a plant with traditional and everyday uses. In the back a warm-toned, wooden desk sits in front of a mauve wall. A can of paint and a roller are off to the side. Gabe is carving words and stars and figures into the wall and down onto the desk. The golden under layers of the plywood emerge, reminding me of the colors in my grandmother’s home. 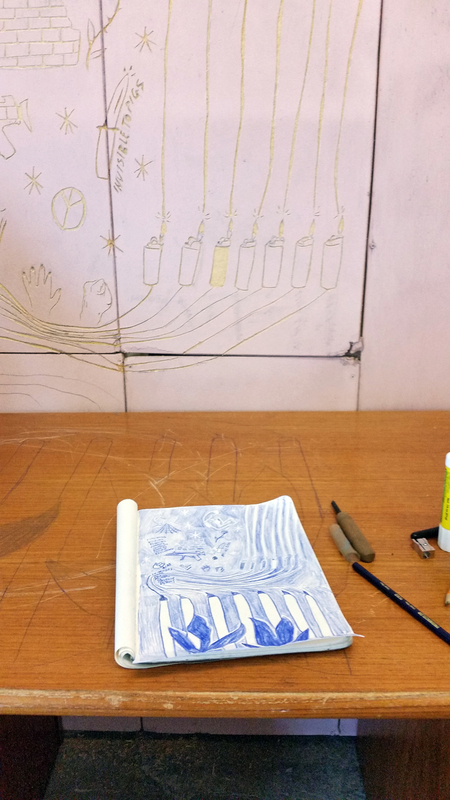 Eventually she will ink blue over the wall and pull linotype-esque prints from it. Eventually the blue will cover the carved stars as a subtle nod toward Ghost Dancers, whose dance also connected physicality with hopes for the future. I left Gabe to carve away at her desk and her wall, chipping away to make physical her own imaginings.